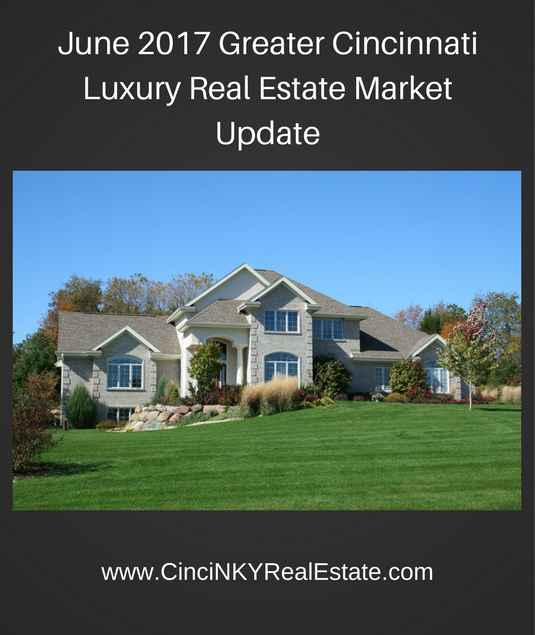 The luxury real estate market in Greater Cincinnati is a bit slower than homes that are non-luxury in category. There are a number of reasons luxury homes (homes $600,000 and up in price) are sitting for longer on the market and requiring steeper price reductions in order to get offers. Local employers such as Kroger and Macy’s are facing tough competition from online sales (Amazon anyone) and as a result are scaling back growth and hiring. Consequently less money is being spent locally to hire people in senior level positions and less money being spent to expand or improve existing stores. Kroger in particular has decided to slow down expansion across the Greater Cincinnati area. Due to Amazon.com announcing the purchase of Whole Foods the grocery sector in general will experience a big disruption which will force grocery retailers like Kroger to spend less and be more nimble in adopting services that customers have yet to express an actual demand for. Less money being spent by Kroger for expansion means less money being distributed across the region, which will slow things down. Also with the upcoming final movement of Toyota from Northern Kentucky to Fort Worth, Texas means plenty of high-level jobs leaving the region along with those employees selling their homes. Those Toyota jobs being higher wage earners will put downward pressure on luxury homes. The Federal Reserve in June approved another interest rate hike, which did not immediately impact mortgage interest rates. What will have an impact on interest rates is the fact that the Federal Reserve has stated they will start to selling a portion of their assets that include Treasuries, mortgage backed debt and government agency debt. The selling of Federal Reserve assets will result in upward pressure on mortgage rates which will further pressure luxury home pricing in a downward trend. So what does this mean for luxury home sellers? If your luxury home has expired with getting sold now might be the time to step back into the market with a more flexible pricing strategy in order to get the home sold. Wait too long and the upward pressure on mortgage rates plus the potential of an economic downturn that is overdue will mean staying put in your current home for longer than anticipated. New luxury home sellers to the market need to take a dynamic approach to pricing and make sure they pay attention to buyer feedback with regards to pricing, otherwise they run the risk of staying on the market too long and being forced to drop their sales price much steeper in order to get an offer.